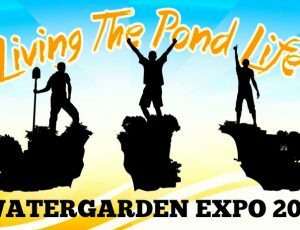 WATER GARDEN EXPO 2017 REVIEW "LIVING THE POND LIFE"
The Water Garden Expo took place February 21-24 featuring a 2 day pond build held at the Pondliner headquarters led by Lloyd Lightsey, The Pond Monster and Demi Fortuna from Atlantic Water Gardens. It was completed by an international group of pond professionals both “seasoned and new”. Many representatives from major brands of pond equipment manufacturers were on-hand during the pond build as well. The pond was beautiful in form, featuring numerous cascades, large boulder stonework, an impressive 10′ X 3′ X 6″ one-piece stone bridge, and a rustic rain shed along the edge. The pond was beautiful in function too, with numerous advanced features like an integrated settling chamber and planting areas. Atlantic components were used for the waterfall system, biofilter system, and skimming system. A passive bottom drain system was installed with an easily accessed, exterior cleanout system. The dual pump pumping system pushes 15000 gallons per hour through the waterfalls. The entire system was designed with ease of maintenance built into it, and yielding the highest water quality possible. After the 2-day pond build the living, loving, and laughing moved into the Shawnee Exposition Center for another 2 days of education, training, and networking. Many of the brightest in the pond industry presented their expertise at seminars with widely ranging topics from fish to finance. Industry pros like Demi Fortuna, Lloyd Lightsey, Eric Triplett, Ed Beaulieu, Kelly Billing, Steve Shinholser, Max Taylor, Kip Northrup, Scott Rhodes and many other top professionals were available to network with. More than 25 exhibitors had booths available to greet the pond pros with a variety of discounted show specials, professional/business services, the newest products and equipment for 2017. Awards for Pond Trade Magazine’s “Pond Artisans of the Year” were given with Dean Pipito from Aquatica winning top honor with “Best Overall Design”. Helix Life Support named Levy Estrada from Levy Estrada Landscapes as “Helix Contractor of the Year”. Some great door prizes were given out to attendees too. 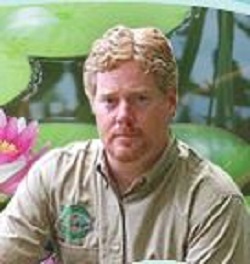 The Water Garden Expo, one of the pond and water gardening industry’s premier educational events, was free to attend and discounted room rates were offered at the local Firelake Grand Casino Hotel and Resort. Breakfast, lunch, and a happy hour was provided daily at the event center. Shuttle service was available to and from the event center. There was plenty of after hours nightlife, fun, dining, and local attractions to check out after the show. With plans already in the making for the 2018 Water Garden Expo pond professionals should make their plans to attend! This is an event not to be missed. The 2017 theme of “Living The Pond Life” was clearly embraced by the attendees of the Water Garden Expo, with alot of living, loving, and laughing going on. To learn more about the inspiration behind “Living The Pond Life”, visit www.living-the-pond-life.com and check out the FaceBook page #livingthepondlife and bring some living, loving, and laughing into your life. Congratulations to Mike Miller, Randy Stewart and the entire Pond Liner / Unit Liner team for an excellent event down in the books!